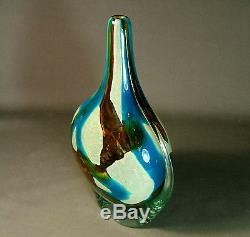 SUPERB LARGE MDINA GLASS BOTTLE VASE. 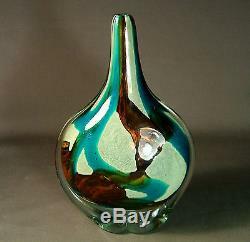 THIS IS A WONDERFUL, LARGE PIECE OF MDINA ART GLASS IN THE FORM OF A STYLISED BOTTLE VASE WHICH DATES, I WOULD GUESS, TO THE EARLY 1970'S. 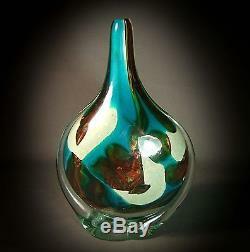 IN CASED GLASS IT IS DEPICTED IN A FREE-FORM ABSTRACT DESIGN, IN TURQUOISE, WHITE, AND AMBER COLOUR WAY FAVORED BY MICHAEL HARRIS (THE FACTORY'S FOUNDER) AND IS FORMED IN A FLAT BODIED, ALMOST MOON FLASK DESIGN, OF CYLINDRICAL BODY WITH AN ELONGATED NECK, WHILE STANDING OVER A LOBED BASE FOOT WHICH CONTINUES TO TAPER ALONG THE EDGE OF THE BODY TO THE NECK. IT IS HAND INSCRIBED AT THE BASE "MDINA". IT MEASURES 8 1/2" (22cm) H x 5" (12.5cm) W ACROSS THE BELLY APPROX; AND IS IN EXCELLENT CONDITION WITH NO DEFECT AT ALL TO REPORT APART FROM LIGHT WEAR CONSUMMATE WITH ITS AGE. THIS IS A STUNNING PIECE OF LARGE ART GLASS FROM A GREAT FACTORY THAT IS IN NEAR PERFECT CONDITION AND WITH A LOW START PRICE SHOULD GET A LOT OF INTEREST FROM ALL COLLECTORS. THERE IS NO RESERVE ON THIS SALE. ALMOST EVERYTHING I SELL IS IN THE CONDITION I HAVE BOUGHT IT, UNLESS OTHERWISE STATED, (I HAVE LEARNT TO MY COST IN THE PAST NOT TO TAMPER WITH AN ITEM), AND THEREFORE I HAVE NEITHER HAD ITEMS REPAIRED NOR RESTORED. I WILL ENDEAVOUR TO REPORT ON AN ITEM WHICH HAS HAD EITHER; HOWEVER I TAKE NO RESPONSIBILITY IF AN ITEM HAS BEEN TAMPERED WITH AND I CANNOT DETECT IT. PLEASE DON'T WASTE YOUR TIME ASKING FOR A B. I WILL DISPATCH GOODS ON CLEARANCE OF ANY OF THE ABOVE. I DO NOT ACCEPT - NON U. ALL PARCELS ARE WELL PACKED AND PROTECTED WITH STRONG BOXES, BUBBLE WRAP AND PACKAGING PEANUTS WHERE NECESSARY. SO PLEASE READ THEM CAREFULLY AS THEY ARE BINDING. DO NOT HESITATE TO CONTACT ME IF YOU NEED ADDITIONAL INFORMATION. 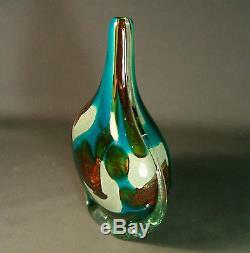 The item "FOR A FULL CONDITION REPORTSUPERB LARGE MDINA GLASS BOTTLE VASE" is in sale since Friday, January 25, 2013. 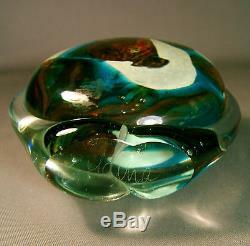 This item is in the category "Pottery, Porcelain & Glass\Glass\Art Glass\Maltese". The seller is "rtzilla" and is located in London. This item can be shipped to all countries in Europe, all countries in continental Asia, United States, Canada, Australia.